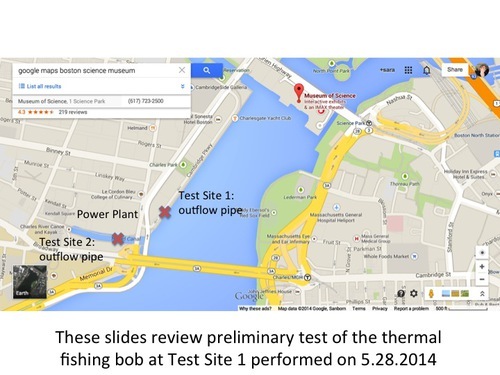 Here is a presentation on a field test using the Thermal Fishing Bob conducted at the Museum of Science on 5/28/14. A special thanks goes out to Kaya Simmons, David Sittenfeld, Emily O'Hara, and Max Liboiron for their hard work on this project. 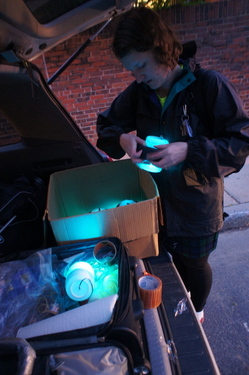 Sara Wylie—Field Test Coordinator. 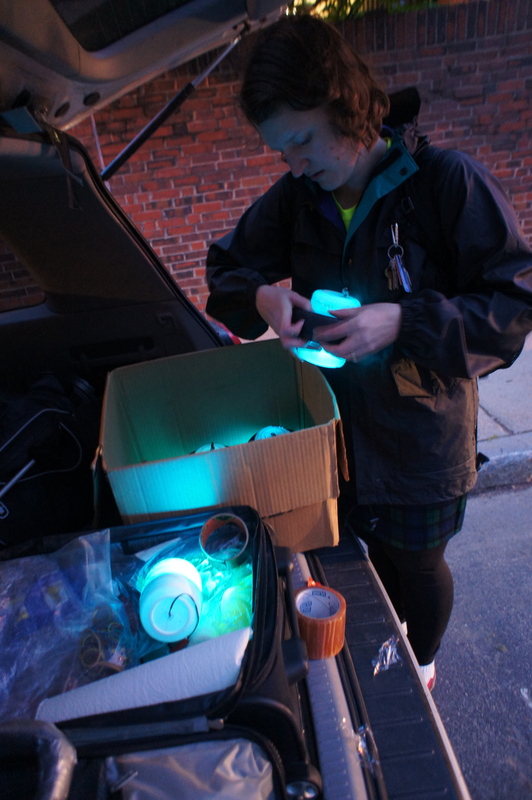 Sara is an Assistant Professor Northeastern University and co-founder of Public Lab. Kaya Simmon—Thermal Fishing Bob set up manager. Kaya is an undergraduate at Northeastern University in Sociology. Max Liboiron—Documentor. Max was a post doc at Northeastern’s Social Science Environmental Health Research Institute. David Sittenfeld and his wife Dorothea—Fishing Bob Operators. David is a program manager at the Boston Museum of Science. Emily O’Hara—Fishing Bob Rescuer! Emily is an exhibit developer at the Boston Museum of Science. The Charles River has been instrumental for textile and spinning mills since the 1700’s for Native Americans, and then English settlers the following century. As a major industrial waterway the river's was a dumping ground for mills, factories and domestic waste including raw sewage. 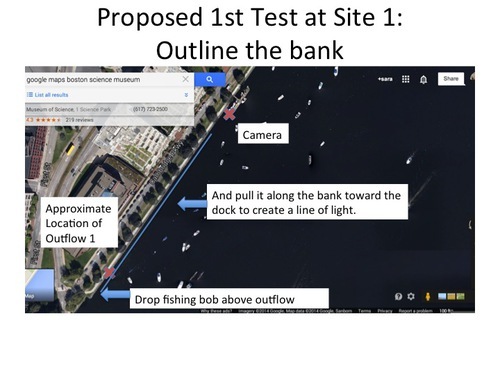 Leaching from riverbank landfills and disgusting odors lead the Charles River Watershed Association, (CRWA), to take action to get a major cleanup in the 60’s. Since then, the CRWA has worked with the EPA to limit pollution, particularly from sewage into the river, and turn make the river swimmable. 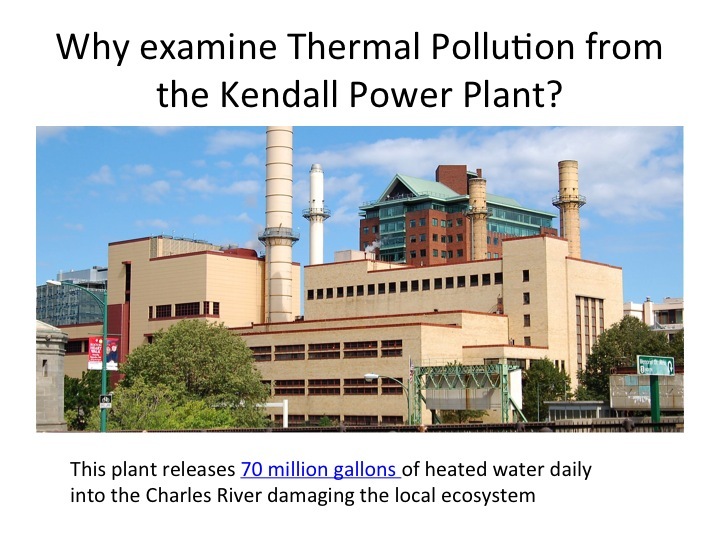 As part of on going efforts to clean up the river CRWA investigated thermal pollution from the Kendall Power Plant. The plant, which began operating in 1949, is one of the main energy providers of Cambridge and Boston, and relies on burning natural gas. 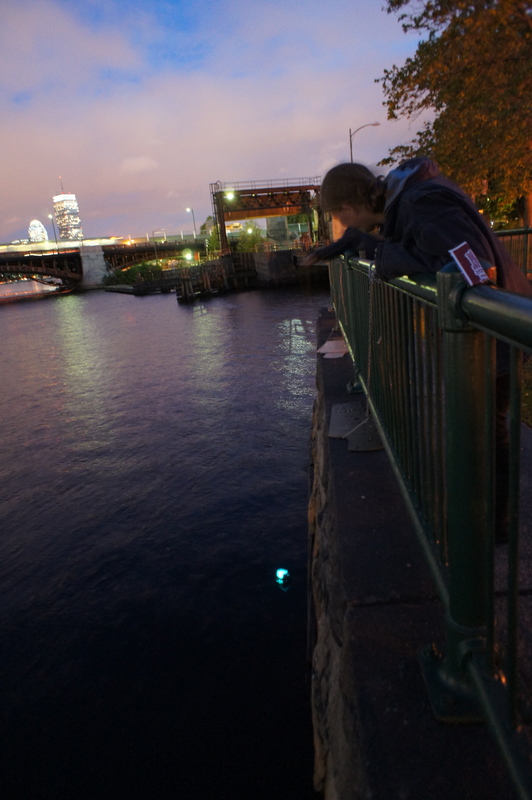 To cool down equipment in the station, the power plants pumps in 70 millions of gallons of water from the Charles everyday. The water, heated during this process as high as 105 F, is released back into the River. The thermal pollution is destructive to fish populations and can create toxic algal blooms. Increased temperature in water decreases the amount of dissolvable oxygen in water, making it more difficult for organisms to live. Because of how sensitive organisms react to temperature change, his leads to either migration or death to these organisms leads to a decrease in Biodiversity. In 2011, the Conservation Law Foundation (CLF), and CRWA won a lawsuit against the Power Plant requiring a new permit that would drastically slash water withdrawal and heat discharge by 95%. This would force to lower the amount of water used by the power plant from 70 million gallons a day to 3.2 million gallons maximum. The permit also requires the power to closely monitor water and temperature levels of the water so that that flows back into the Charles River is not harmful to ecosystems in the River. A potential solution to the Kendal Power Plant's Thermal Pollution? In 2013, the French Power company Veolia Energy North America took over operation of the Power Plant and is working on a novel solution to it’s thermal pollution that would use steam from the power plant to heat building in downtown Boston. 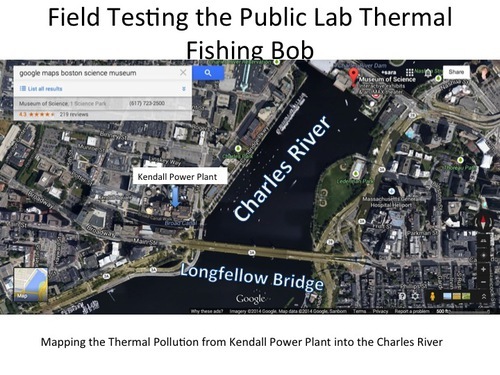 Veolia is spending $112 million to build a one-mile steel pipe across the nearby Longfellow bridge that will carry steam generated from the Kendall Power Plant and into Boston. The project, called Green Steam, would both reduce the plant’s thermal pollution and will reduce Boston’s total amount of Carbon emissions by 6%. 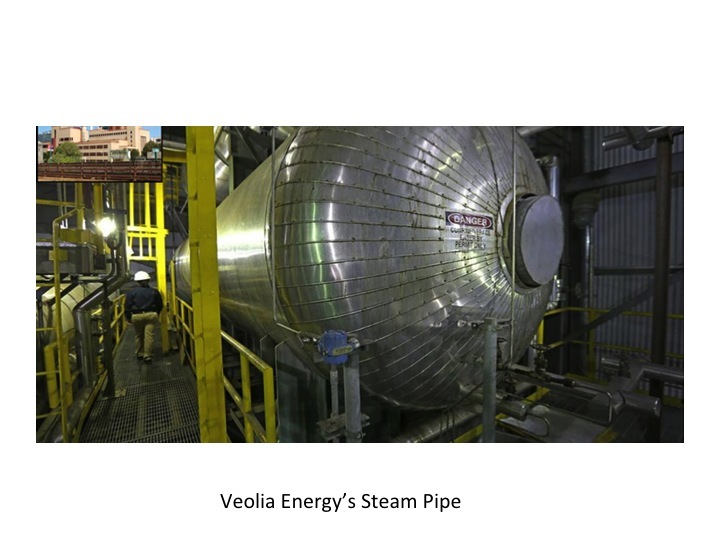 According to Veolia, the energy saved by reusing the steam is equivalent to same amount of energy generated by 80,000 cars. The system will be able to convert 80% of natural gas into energy, up from 60%. 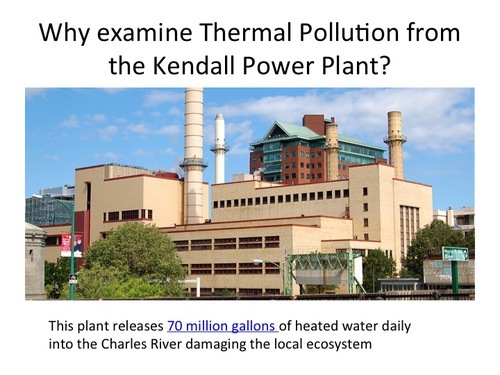 Because of delays with Veolia fully taking over operation of the power plant, the Kendall Power Station still runs its same procedure prior to the 2011 renewed permit. The Charles River is a great source for us to test our Thermal Fishing Bob’s because we can measure the temperature relation of the River in relation to the outflow pipes and color map the difference in temperature. The water source is also accessible, as we can easily get a reading of the temperature and adjust the color range on the Arduino circuit if needed. Teaming up with Staff at the Museum of Science, David and Emily, this project investigated whether the Thermal Fishing bobs can detect the Kendall Power Plant’s Thermal Plume. We plan to test a two different location. This slides set describes the results of our first field test. If we can map the Thermal Plume successfully this summer, we will be able to do a similar map next year after the steam has been redirected from this outflow. We should be able to see a significant difference between the plume now and after Veolia energy completes it work. For this location we discussed pulling the Thermal Fishing bob along the bank of the river to try and to identify the outflow. 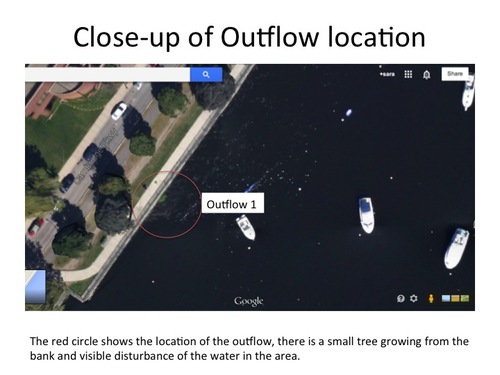 The temperature range during our preliminary testing at the site of the outflow pipe with an Infrared Thermometer was 71-72 F, water tested by the dock was 68 F.
The red circle shows the location of the outflow, there is a small tree growing from the bank and visible disturbance of the water in the area. As a second test in this location I propose we drop the fishing bobs in and let them drift with the current. 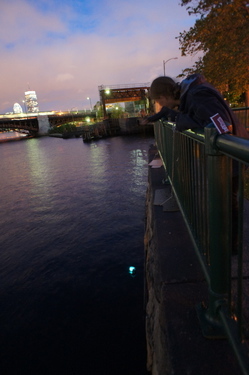 To get a sense of the temperature of the water, David took a buck of water from the Charles River. We used different types of thermometers for testing. To conserve the power in our 9v batteries, we attached the battery attachments to the Arduinos as soon as we got to the spot. Once the batteries were in, we had to waterproof the Fishing Bobs by circling the container with waterproof tape tightly around the seals, to ensure water would not get in. After that, we placed foam floaties snuggly around the fishing bobs so they would not sink to the bottom. One of the Fishing Bob’s was fluttering between our whole color range, from Blue to Red, before we even put it in the water. To fix this problem, Sara introduced the idea of using a battery connector. Sara and Kaya took a look inside and saw that the battery connector going to the power and ground ports on the analog side was bent and needed to be replaced. Thankfully after that repair, the Fishing Bob was fully restored. The last part of preparation was to add the fishing reels around the Fishing Bobs. To do so, we first tied around the container a few times and then around the foam floaty and made a hard knot. Each reel could go approximately 200 ft. in length. You can see the weights on the thermistors, we used nuts. We taped the floaties onto the bobs so they wouldn’t get separated in the water. 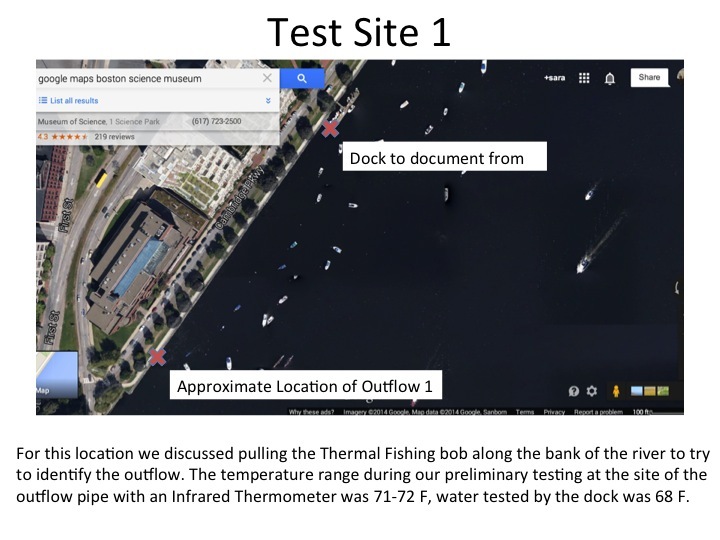 Because our temperature range for testing was between 65-75 for all of the Fishing Bob’s except one, (65-85), the ambient air temperature of 50 degrees Fahrenheit caused the Fishing Bobs to turn blue as soon as we turned them on. As Kaya put it into the water it was clear that tying the string to the side of the bob, made the unit unbalanced. Sara retying the bobs so line was in the middle and the bobs weight was more centralized during entry. 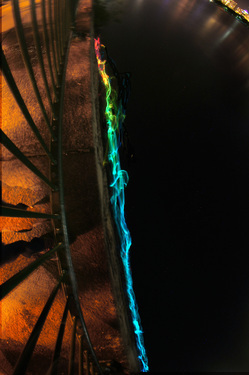 Theses long exposure photos taken by Max show the color of the Thermal Fishing Bob on the same area for four different trials. 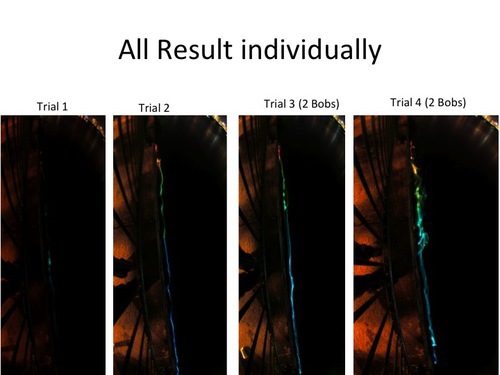 The first two trials are just include one Fishing Bob, while the third and fourth trials are of two Thermal Fishing Bobs. 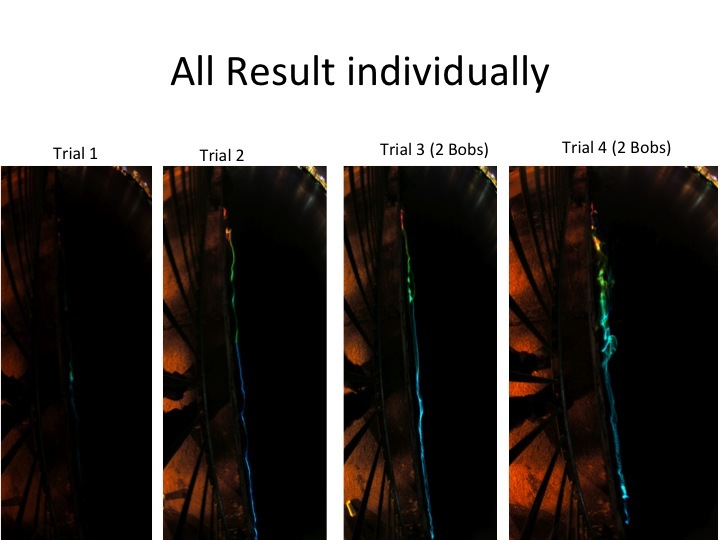 Each trial had consistent color mapping, starting out blue and switching to red at the end, which meant that our experiment was repeatable, thus more accurate. 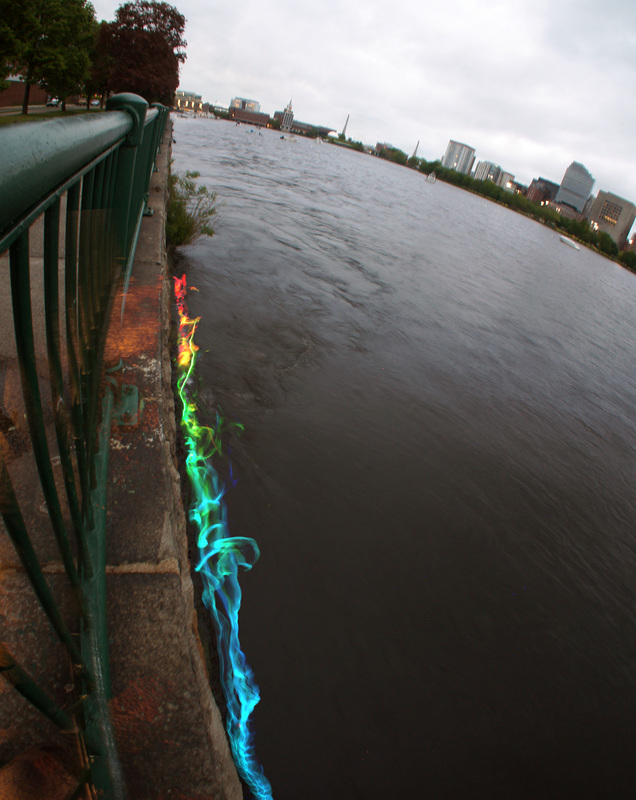 Overlay of results on day lit image from upstream of the plume. The photos here the individual trial overlaid in Photoshop using a Lighten color/transparency layer filter. They each took around a minute, and that was mostly to make sure they were aligned as perfectly as possible. Here are same overlaid photos at night. This process gives it a ‘flame-like’ appearance. 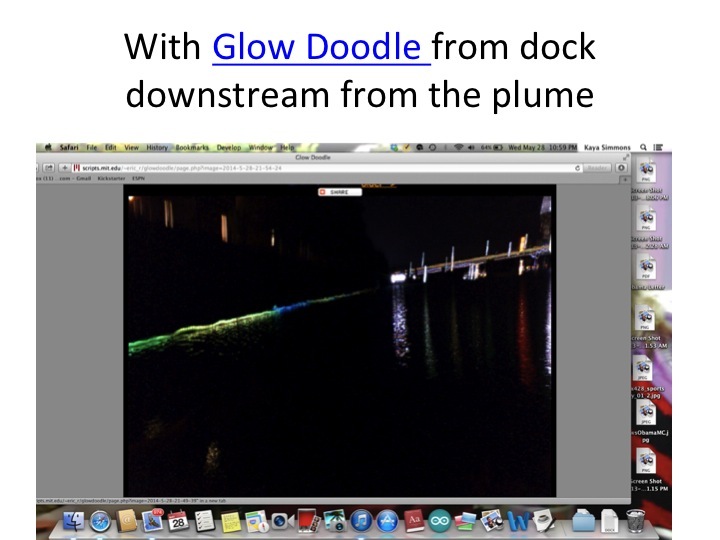 Using the Glow doodle App created by researchers at MIT Kaya was able to get this image from laying down at a nearby port about 200 feet away. The Thermal Fishing Bob started out Blue and was difficult to see on the App, causing concern that the long exposure photo was going to be a bust. Yet as David and his wife walked the Thermal Fishing Bob closer to Kaya, the colors and color change became more vibrant. David and his wife walked slowly, completing this test in about 5 minutes. 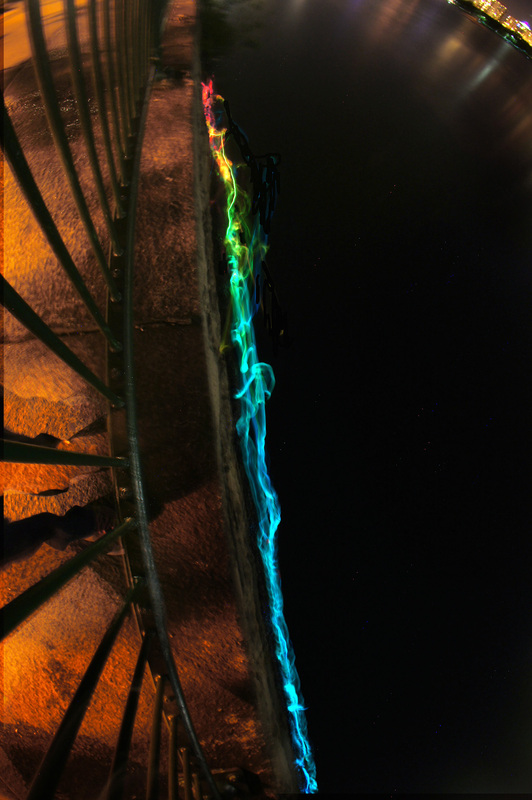 You see the Thermal Fishing Bob changes from blue to green to yellow frequently in the beginning, then has steady streaks of blue, yellow and green towards the end of the picture. It is interesting to see such a temperature change in such a small amount of space. Another problem was that once the Bob’s were in the water, they got caught on rocks or branches on the side of the wall. To get it out, Sara and Emily used a contraption that included a car window snow sweeper tied to a long bit of line. We hook the sweeper underneath the string attached the fishing bob, and once hooked, we pulled up to retrieve the Bob. Working in the dark made it hard to see the Bob, it’s line and objects that they might get caught on. However, after a few trial runs we were able to eye ball where the Fishing Bob would get caught, and tried to avoid a nearby bush and underwater rock that was giving us trouble. For future testing, we will bring a boat hook or a long pole that will make retrieving the Bob’s quicker and easier and flashlights. One of the main problems that we ran into was that the circuits inside the Thermal Fishing Bob’s disconnected multiple times in a couple Fishing Bob’s, making them ineffective. Kaya had to make readjustments before the Thermal Fishing Bobs were taped closed. To ensure that the most vulnerable components, the thermistor and the wires from the battery attachment, were secure, Sara introduced the idea of using connects that sealed the wires from thermistor and battery attachment with a screw, and the connectors plugs directly into the Arduino. Even after one of the Fishing Bobs was sensitive and disconnected when touched, so we were not able to use every Bob. For next time, we also need to work on waterproofing the Thermal Bob’s better, as three of them took on water and two of those burnt out. 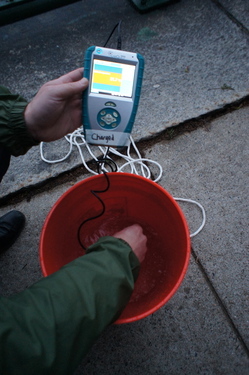 Either we will double down on the waterproof tape, or will come up with a new system. After these units had dried they still worked however. definitely include how these photos were taken. Cool!